"E-mail is a way for me to establish my professional boundaries. It allows me to set the tone of the discussion." There are three words that can strike fear into the hearts of an e-mailer. Reply. To. All. The potential boomerang effect of a simple new employee introduction, farewell to a departing fave, or even a reminder that the office is closed can turn into a race to the bottom. In some cringe-inducing cases, it could even cost you your job if a sly bit of banter accidentally makes its way to the inbox of the higher-ups. In the case of the poor slob in this episode of "Cubicle Creepshow: Reply, You Die," it might have earned him a date with an otherworldly entity. WATCH and be warned. But on a serious (non-monstrous) note, communication faux pas can wreak havoc on entrepreneurial and corporate life. To help you better equip yourself to deal with an increasing number of ways to express yourself, we consulted Afrobella (aka Patrice Grell Yursik) one of the OG influencers on social media who escaped office life back in 2009 to break new ground within the beauty space via Afrobella.com. Afrobella depends on her keyboard communication skills for her success, so she was generous enough to drop some gems on our audience including the future of e-mail, how she manages her message count and why getting sloppy in the “to” field is ill advised. She also expounded on the trouble with the (text) bubble. So, stop drafting that passive aggressive message to your annoying co-worker for a minute or five. We’re about to put you on game via this Q&A with a master of many messages. Q: Let’s cut to the chase here, Afrobella. Tell us, what to you is THE biggest faux pas of work e-mails? Afrobella: Reply-to-all is the first thing that comes to mind. We’ve seen it blow up in people’s faces from time to time. I don’t know why people do this. It’s stupid. Email has been around long enough for you to know not to send a message, or a response, to your whole address book and let them see who everybody is. Another issue is people who are using their address books willy nilly and not double checking to see if the “A” you type in leads to your co-worker, and not “Afrobella the blogger.” This happened [recently] when I got a message from a tech company in San Francisco. They sent me their marketing plan. I feel that people who make errors like that are working too fast and not working at peak capacity; they are spread too thin. It’s basic carelessness that can speak to a lack of professionalism if you aren’t cautious. Q: So now you’ve got the tea on that company’s marketing plan. Is that the worst “oops, accidental” address book message you’ve seen? Q: Yeah, that was probably a wrap. E-mail is so critical to the way we communicate, even though there are many other ways to reach out. How does the way you express yourself through e-mail affect your business dealings? 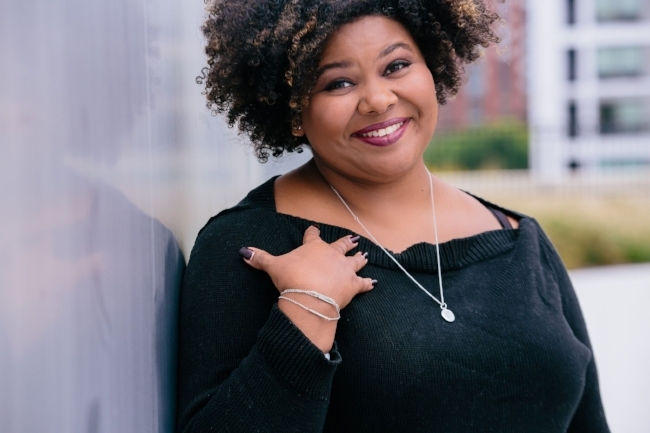 Afrobella: Well, I can be an empath and very warm and friendly in person and I think sometimes that may come across to some of the business people as “she’s a nice girl, a nice lady,” but they might not think of me as a real professional. E-mail is a way for me to establish my professional boundaries. It allows me to set the tone of the discussion. Sometimes things I find personally difficult to articulate in face-to-face conversation is more comfortable to communicate in e-mail. It also provides me with a paper trail. As an entrepreneur, I have to be able to negotiate rates and ask upfront questions. That’s where expressing myself through e-mail has helped me versus a discussion at a lunch or dinner meeting. I think there is also a generational difference. I think about this Lil’ Wayne line: “I’m approving million-dollar deals from my iPhone.” I’ve been seeing newer generations of my peers even starting to move away from e-mail. One of my friends told me she was annoyed because public relations people hit her up through whatsapp and FB messenger. We might say: “Can’t you send a formal e-mail?” Our parent’s generation would say that should have been a formal letter. Q: Despite which medium you use, there is always a propensity for passive aggressiveness, which is somehow easier to do in written versus spoken communication. What is your recommended plan of action when you see a colleague or collaborator starting a “cc” war and involving upper management? Afrobella: (deep sigh) Yes, that was a heavy sigh from deep within. I’ve seen a couple of these things happen. I was in a creative office, but it was an office nonetheless and part of the reason I haven’t been in one in quite some time is this passive aggressive crap that unfolds in the workplace. You sometimes need to “cc” with certain people because they need that paper trail kept on them, and that’s better than “bcc.” Behind that “cc” there may be a “bcc” you don’t even know about. I find that really sneaky and ugly. If I find out you’ve broken out the “bcc” on me, we’ve got a problem. But with “cc,” well, you’re letting me know this person you’ve copied also knows what is going on and, as long as I do my job, I have nothing to fear. Now we can all completely communicate in the open. I’ve seen it get people in trouble in the workplace. Sometimes you are in a workplace that’s less personable and in one where there is an existing layer of cattiness and competition. Sometimes you are in a snitch culture and rather than do or do not “cc,” my suggestion is to get out of that altogether. Afrobella: If I don’t know you and we don’t have this rapport, I would prefer you not to call. You don’t know what I might be doing. It is best to email me and if there is a friendship or less formal business relationship, text me. Probably at this point, the phone is the least effective way to reach me. If you e-mail, I will hit you back and send a message that is direct and clear. Q: Will e-mail ever be extinct? Why or why not? Afrobella: I hope not. With some of these text-based messenger services, the bubble stresses me out and especially with older people who take a long time to type. I find it agonizing. I really feel in general so much communication has been leading to anxiety and is in fact, anxiety-inducing. I think e-mail will fade into the background and, in fact, I just read article to that end. I don’t think it will happen in my lifetime but younger and younger generations are using multiple platforms for communication. One thing I have seen is reduction in blog comments and discussions. That used to be a way to build relationships. Facebook, Twitter, Instagram and YouTube came into it and now, information becomes pulled into these different directions. Communication is scattered to the wind and I think that is the future of e-mail unfortunately. If I get a [client] opportunity, it may be in the form of alert to check something else. E-mail is so relevant but more and more, I’m seeing alternatives and young people who don’t even have e-mail addresses and don’t use it. My nieces are 12 and 10 years old and they are on the phone more than I would like. And they are not using e-mail or Facebook. Q: How do you personally deal with inbox overload? Q: Well, inbox zero may not even be an issue as some say that e-mail is edging toward antiquity. We have even less space to make a point or do a deal. Do you believe that the rise of Slack, Basecamp, text, messenger, chat, have improved or regressed the way we communicate? Afrobella: For me, it can be a little adverse and I am scattered enough as it is. I don’t need people to have six ways to contact me. I get frustrated. For example, I was complaining to my husband that I lost a wonderful opportunity because they sent the inquiry through LinkedIn messenger. That’s not how you reach me. That’s how that person chose to reach me. And when I finally saw the message, two weeks had passed and I sent an e-mail and told her that she sent the message to a forum that I don’t check. She said “I’m so sorry and the lesson is check everything.” It’s a lesson I learned the hard way. Last year, I thought I had the bandwidth to manage a bigger team. My sister, with whom I was working, was into Asana. So now we’re using Asana and I’ve got something else to check now. She’s sending me e-mails asking me to check Asana. I’m saying to her maybe if I had a phone with infinite memory, I could have all these apps but that isn’t the reality. I’m pretty much phone, e-mail, and most social platforms. If I’m managing a big team, Slack and Basecamp are what I might use as my friends with larger scale work are benefitting from it. But if you are working independently, how many of these work-related mini networks do we actually need and what does it do to the other ones when that becomes popular? It’s Basecamp versus Slack and moving thing to thing, but let me tell you, if these little mini networks are run by a 23-year-old who is into texting and has this budget, who am I to tell you don’t give me money? I realize that I need to rise with the tide.